Dr. Charles Murry, from the Washington National Primate Research Center pulling transformed stem cells out of a deep freeze at the Murry lab at South Lake Union. Murry serves as director of the Center for Cardiovascular Biology and co-director of the Institute for Stem Cell and Regenerative Medicine. SEATTLE – Promising new heart disease treatment being researched at the Washington National Primate Research Center receives $10 million funding infusion from Washington Research Foundation to bring total funding to $25 million. The stem cell-derived therapy could change heart disease treatment following a heart attack and impact a leading cause of death globally. Suitability of stem-cell derived therapy being tested in nonhuman primates to assess scalability, feasibility, safety and efficacy prior to human clinical trials slated for 2019. Pluripotent stem cells provide a potential solution to current epidemic rates of heart failure by providing human cardiomyocytes (heart muscle cells) to support heart regeneration. Studies of human embryonic-stem-cell-derived cardiomyocytes in small-animal models have shown favorable effects of this treatment. Research conducted by Drs. Charles Murry, Michael LaFlamme and a team of researchers from the Institute for Stem Cell and Regenerative Medicine resulted in the 2014 article in the journal, Nature, supporting this therapy’s scalability and viability of remuscularization in an infarcted nonhuman primate heart. 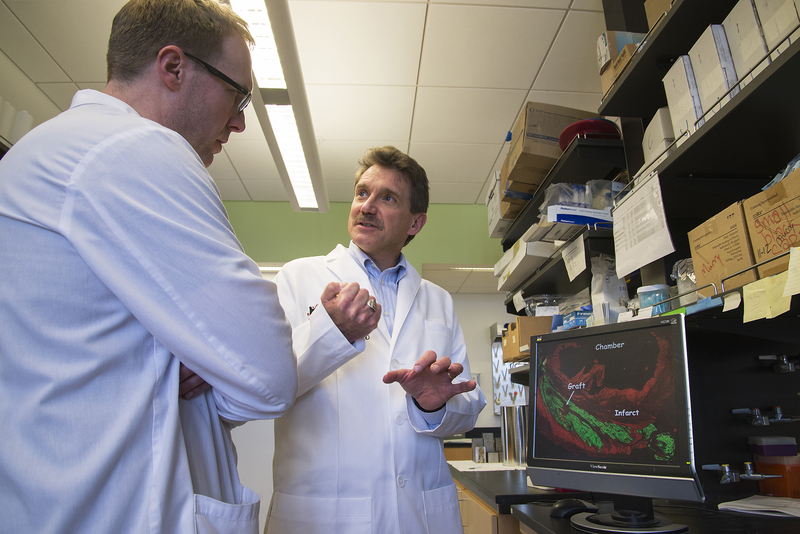 Research scientist James Fugate (left) and Dr. Charles Murry, PhD, professor of pathology, bioengineering and medicine/cardiology, (right) at the Murry lab in South Lake Union. Murry is director of the Center for Cardiovascular Biology and co-director of the Institute for Stem Cell and Regenerative Medicine. Initial funding for this work came from the Ignition Award Pilot study program offered jointly by the Washington National Primate Research Center and the UW Institute for Translational Health Sciences. The purpose of the Pilot award is to explore innovative areas of nonhuman primate research and generate preliminary data to serve as a basis for submission of new research grant applications. Applications for the pilot program are currently being accepted with a deadline of February 19, 2016. The WaNPRC performs critical biomedical research leading to new advances in science and medicine. WaNPRC researchers are working to develop effective vaccines and therapies for HIV/AIDS and other infectious diseases as well as new advances in genetics, neuroscience, vision, and stem cell biology and therapy. The WaNPRC directly supports the National Institutes of Health’s mission to translate scientific advances into meaningful improvement in healthcare and medicine. Learn more at www.wanprc.org.